Our final workshop winner is Ann Snuggs, who "tackled" Mondrian with a fish theme: "The One that Got Away." Ann, you win Erik Davis' set of 4 original watercolor paintings. 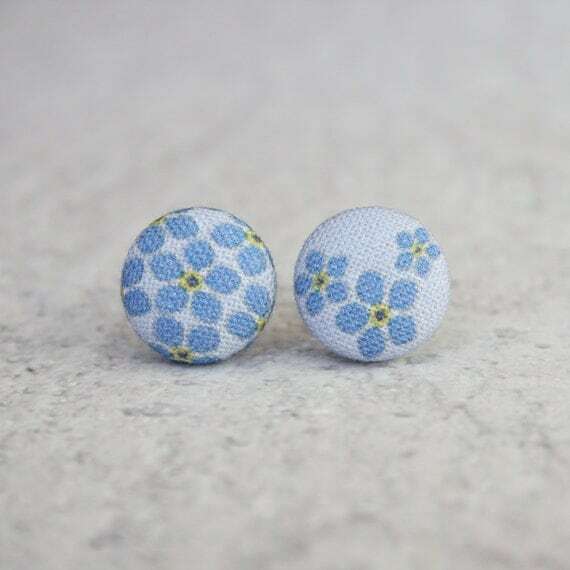 Ann, please shoot me an email at nicolettaarnolfini@gmail.com, and I will get those in the mail to you. Fun update from behind-the-scenes: Please watch for two new classes to launch soon on Skillshare: one on Miro' and the next on Klee. Can't wait to share these new Abstract Elements classes with you! 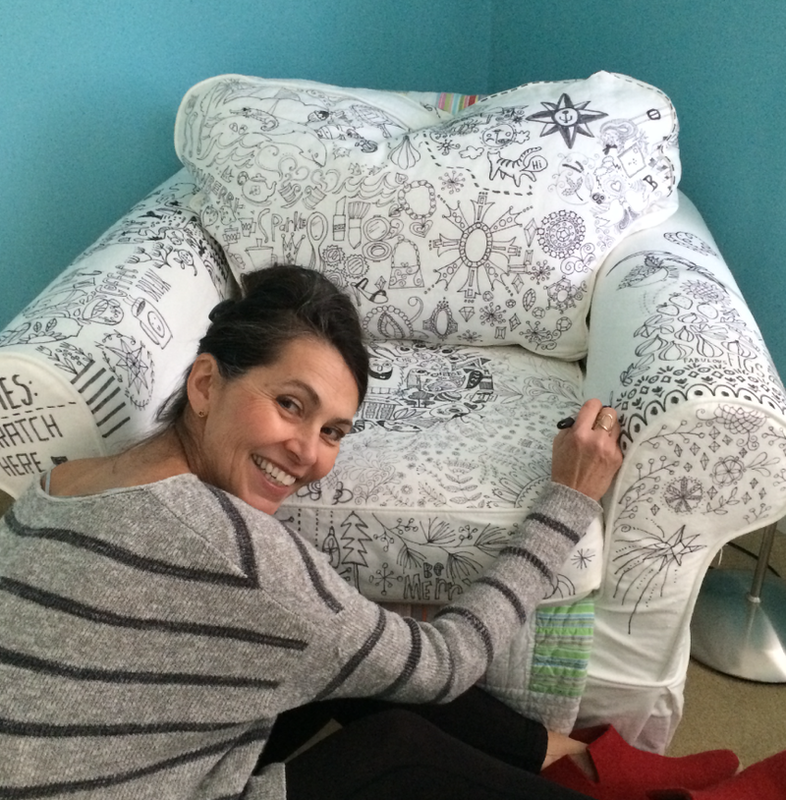 I am so excited to bring you a special interview with Salli Swindell of They Draw & Cook (TDAC). Together with her brother, Nate Padavick, Salli founded TDAC in 2010. Today, TDAC is the internet's largest collection of illustrated recipes created by artists from around the world. This interview is timely because on Sunday, I will announce three winners from my Skillshare workshop, and one of those winners will receive TDAC's very first published cookbook -- a hardback, eclectic collection of 107 richly illustrated recipes. In 2011, Salli and Nate founded They Draw & Travel (TDAT), now the largest collection of illustrated maps on the internet. The sister and brother duo form Studio SSS, an illustration and design team. 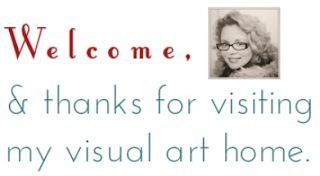 Art directors use TDAC and TDAT as their go-to to find talented illustrators and designers. Salli and Nate's selfless dedication to promoting the the work of artists has catapulted their status among an adoring and loyal art community. Salli manages TDAC, while Nate focuses on TDAT. Today, we learn a bit more about the fascinating behind-the-scenes world of Salli's brainchild, TDAC, and other awesome stuff she has going on. 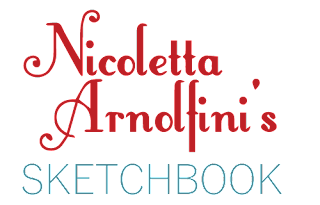 Nicole: They Draw & Cook has a following of over 255,000 on Facebook, almost 3,500 on Twitter and over 50,000 on Instagram. When you and your brother, Nate, started the first TDAC blog, did you ever envision it would become the movement it is today? To what do you accredit this exponential growth? Salli: We had no idea what we were starting! Looking back I think three things helped the site become what it is today. #1. Illustrated food was just starting to trend and our name They Draw & Cook was very easy to understand. #2. The initial group of eight recipes that we posted were created by friends who had large blog followings. Once they posted their recipes to their blogs it was easy for artists all over the world to discover the project. We started receiving recipes from artists in Brazil, London, and Russia! All of the artists who submit are very generous, talented, and inspiring. #3. We reached out to every single artist who submitted a recipe to thank them and start a dialogue. We’ve made so many new artist friends around the world and feel that TDAC has a very genuine sense of camaraderie and community. 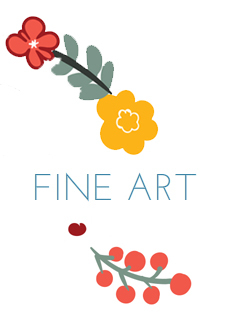 We post and showcase almost all of the submissions we receive and embrace both professional and amateur artists. N: You and your brother are incredible visual artists. Had you collaborated with Nate on a project prior to founding TDAC? S: We became studio partners about 15 years ago. It wasn’t a big business decision or anything, it just kind of happened. Nate and I have very different backgrounds and training so we each bring different things to our business…mostly laughter! N: What is your favorite art supply right now? S: Right now because of #the100dayproject I’m in love with Caran D’ Ache colored pencils on cheap brown craft paper. However, most of the work I sell and license is digital. N: I have enjoyed your pineapple art on Instagram for #the100dayproject. What inspired you to choose pineapples? S: Pineapples have so much personality, and I’m finding you can really push the boundaries and still maintain the recognizability. My main goal was to break away a little from the computer and try using paints, pencils, collages, stitchery, and paper crafting. Last summer I taught an online course Build a Freelance Illustration Business and the participants kept coming back to the topic of “style.” From my experience “style” is way bigger than your art technique; it’s also about how you think and how you manage your projects, deal with clients, etc. At some point during the class I said, “You’re style is going to be unique because it’s yours. If each of us were to draw a pineapple we would have dozens of very different pineapples.” The next day we all started posting our pineapple illustrations and found they were diverse and engaging! So I guess the pineapple theme was still on my mind. 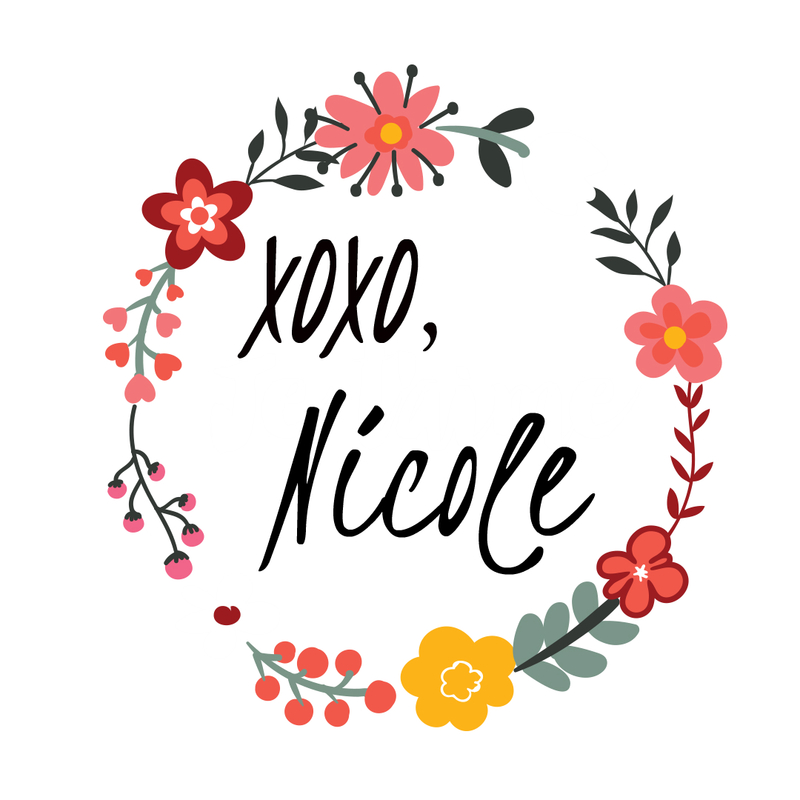 Nicole's note: Salli's course is available online, and you can sign up here. N: What is your favorite medium that you create in? S: For both myself and Nate we cannot live without our Wacom tablet and computer. I also love FW acrylic black ink and my old gloppy ink pens. They make the most random blobs! N: Since 2010, TDAC has published 11 books, both collaborations of artists and single artist books, and you must be proud of these accomplishments. But what is the one thing you are most proud of about TDAC? S: We are most proud of the work that artists all around the world are receiving because an art director has spotted them on one of our sites. Our main platform from the very beginning was to give artists a place to showcase their work via something purposeful - a recipe or map. Both Nate and I have always felt extremely fortunate to have successful careers as illustrators. We’ve had a few good breaks and have wanted others to share the same experience. What started out as a small project for nine of us to meet a few new clients ended up being a place for thousands of artists to meet new clients. That is something we are really proud of and celebrate every single day. Bonus: we’ve met SO many super cool people because of TDAC and TDAT! Thanks, Salli, for spending some time chatting with us about an inspiring and supportive artistic phenomenon. 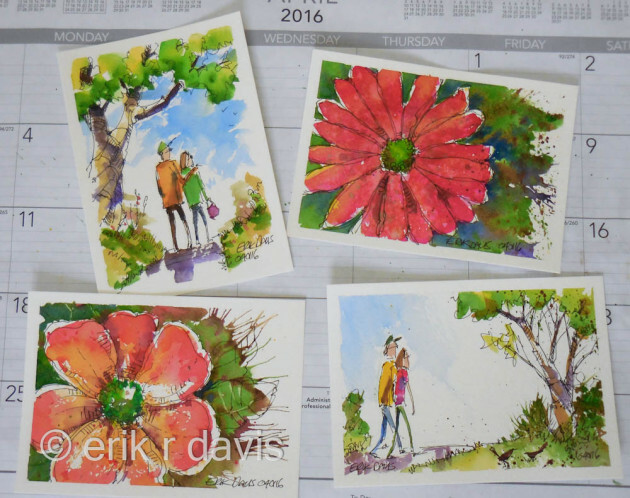 A set of four handpainted watercolor paintings by artist Erik Davis. 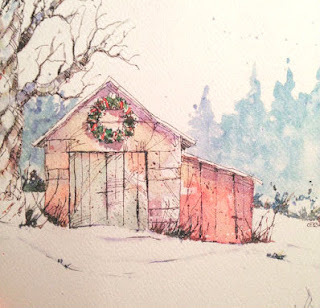 Each painting is on archival Strathmore 500 series paper and designed with Da Vinci watercolors and PITT pens. I will announce winners this Sunday, but in the meantime, I wanted to introduce you to contemporary artist, Erik Davis, and his color-infused work. Special thanks to Erik for taking time away from his art and his garden to give us some insight into his work. Nicole: What’s your favorite subject matter to draw or paint? 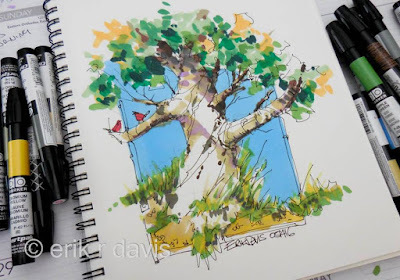 Erik: My favorite subject matter for sketching is nature: anything nature-based or found outside including flowers, trees, treelines, an old tree stump taken over by flowers, and old fences. The occasional little outbuilding or street scene may pop up from time to time, but nature is my go-to subject. N: What’s your most used art supply? E: My most used art supply is the Faber-Castell PITT pen, either size S or F. I use these pens for everything. They work great on all papers and surfaces - watercolor paper, sketch paper...everything. N: When you need a break from making art, what do you do to relax, unwind, and come back ready to make art again? E: I have two favorite art breaks. Working in the gardens and LEGO. Love them both! Nothing resets my brain faster and more efficiently than working in the yard. It's my ultimate reset button. Actually just being outside resets the old head. The LEGO obsession is just fun. Either working from kits or free building, I find the little plastic bricks to be very therapeutic. Image from Erik's Facebook page, where he posts images most often. He accepts friend requests from art fans. You may want to message him privately first. N: How do you stay inspired? E: That's tough. I find different ways to stay inspired. If I find I'm having troubles getting motivated or finding that right subject matter, I start to just doodle little robots or birds doing human things. These usually are found on scrap paper in my room or at work, but they rarely see any future projects. I also try to create an alter-ego cartoon figure for myself. I haven't really finished one, but it's mainly just to keep the gears moving. N: How do you overcome the fear of the blank page or blank canvas? E: When it comes to a blank page that seems larger than life, or a new sketchbook that is too nice to work in, the best way I have found to get started is to put away the pencil, grab a pen, and just start making shapes. I just commit to getting marks on the page. I may not have a plan, but I just start making marks and getting ink down. I usually end up with a flower or a tree, but grabbing a pen and jumping in works really good. N: I loved your holiday cards and sent them out last year. How can we follow your work or find out about fantastic new things from you? E: I update my website and Twitter account, but I post to Facebook most often. To continue to encourage and inspire my Skillshare students completing our 2 week MoDeRn ArT Challenge, I wanted to provide another outstanding class project example. Fie (short for Sofie) is a bioinformatics PhD student who creates things and takes classes on Skillshare to unwind in her free time. Fie is enrolled in my Kandinsky course. Students in the workshop come from either this or my Mondrian "Abstract Art with a Twist" series of courses. Fie completed several small paintings for this class (pictured above). Fie researched several abstract artists, including Kandinsky. She started her project with some pencil sketches (above). Peace, Improvisation, and Spring were the motivational words behind her project. Next, Fie worked on moving from sketch to paintings on paper. She eventually decided on a vertical format and a heavier paper for her final paintings. One aspect (out of many!) that I appreciate about Fie's process was that she took some very "busy" reference works like these below, and broke them down into bite-sized, understandable elements. This helped her to organize her thought process and proceed with success through her project. It also added value to her education by allowing her to re-trace the steps of abstract artists and eventually, to add her own style to these works. Her ability to break down the complex into the most important and basic elements helped all class members understand the impact of color combinations and the significance of the shapes. Fie's multiple paintings also improved her familiarity with abstract art. One thing that helps me overcome my fear of not creating a great painting is this -- you cannot ever achieve quality with first achieving quantity. The more you paint, the more you grow as an artist. Here is a bonus that Fie shared with the class: Fie usually creates representational sketches. Here is a sketch with several of her doodles over some watercolor "blobs." She painted the non-representational water splotches first and then imagined the characters inside of them. What an excellent, imaginative exercise to boost creativity! Special thanks to Fie for allowing us to view her project behind the scenes! Last Sunday, my Skillshare students began another awesome 2 week MoDeRn ArT Challenge. Daily email prompts take them step-by-step through 14 days of learning to paint like a modern art master. Students enrolled in this workshop come from either my Kandinsky or Mondrian "Abstract Art with a Twist" series of courses. Over the next few days, I will give you a behind-the-scenes glimpse into some outstanding projects from students who have taken this workshop with me in the past. 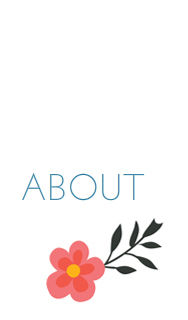 You can look at these projects in more detail in the workshop project page on Skillshare. An architect from Ecuador, Jamila gifted the class with a powerful floral interpretation of Kandinsky's Squares with Concentric Circles. Jamila's floral imagery (through geometric patterns) and soft and hard edge techniques brought to my mind another artist: Georgia O'Keefe. 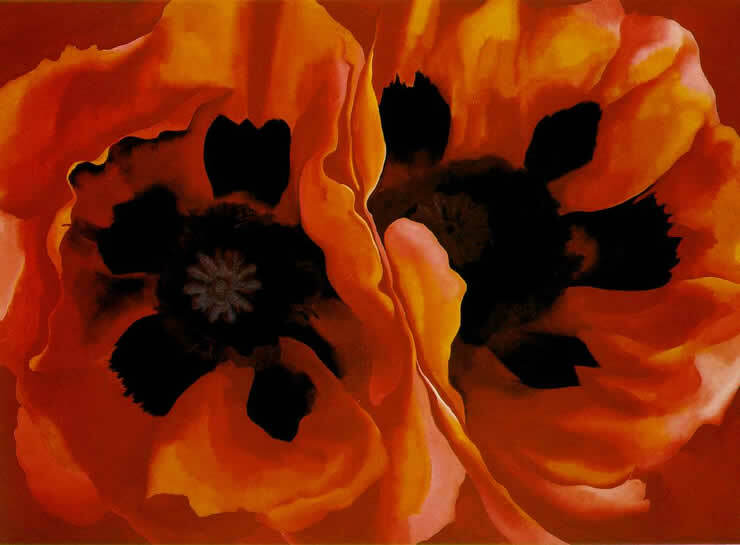 Here is her painting, Oriental Poppies, from 1928. One of my favorite aspects of our workshops is the connections that participants make from one reference artist to another. Students can freely take the elements they choose from a wealth of sources and make their own project. As you can tell, I am very proud of the growth that each student demonstrates from sketch to final product. We learn so much from each other. The class interaction and visual sharing of snapshots of works in progress spark fast and marked developmental jumps in the class as a whole. Thanks, Jamila, for sharing this beautiful work! What's happening in my studio these days? I'm hard at work on producing more Skillshare classes. Watch in the near future for a class on Joan Miro' and another on Paul Klee. 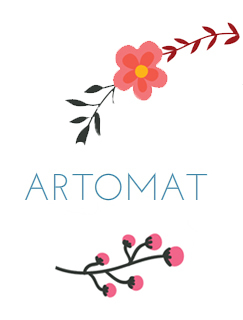 Also, I have begun a new batch for Art-o-mat and am trying to stay on top of #the100DayProject on Instagram. Hope your art adventures are filled with fun and learning. Join me for a 2 week workshop on Skillshare. You will receive daily email prompts to help you make good progress toward your final project for either my Kandinsky or Mondrian course. As always, I will award prizes to 3 outstanding participants. Here is a glimpse of the prizes below. 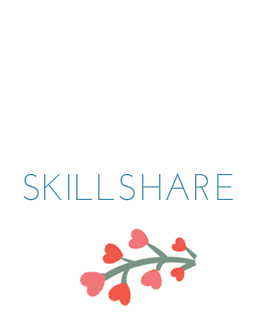 One student will win a year of premium Skillshare membership (a $96 value). Who wouldn't like a great reason to learn any time you want to, from the comfort and convenience of your home? 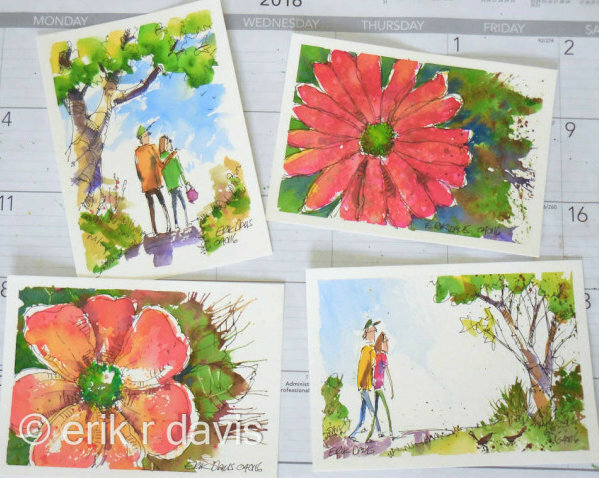 A second student will win 4 original watercolor painting postcards by contemporary artist Erik Davis. Erik has a beautiful blog and a Facebook page sparkling with color. His vibrant hues and exciting brushwork make him a favorite source of inspiration. A third student will win one of my favorite gifts of all time, a cookbook by talented illustrators called They Draw and Cook. 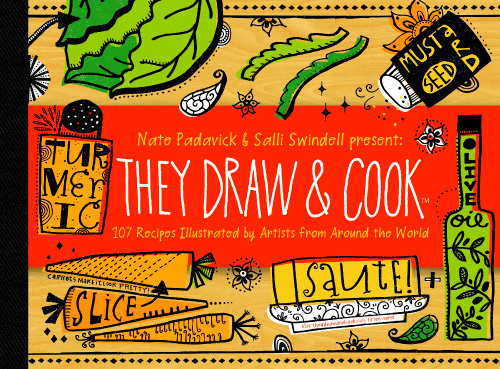 Brother and sister team dynamos Salli Swindell and Nate Padavick compile artwork from talented illustrators with original recipes from around the globe in this page-turning feast for your eyes. Their website features even more recipes by contemporary illustrators. So many excellent giveaways, so many reasons to enroll in my classes today! Plus, in the Skillshare online environment, you learn with other supportive, creative classmates who interact with you and demonstrate their processes. Sign up now and join me starting May 15. Can't wait to see you there! Sunday, May 8, is Mother's Day in the U.S. 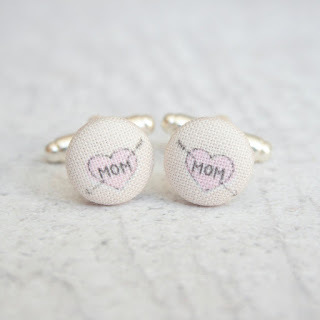 I wanted to share with you some ways to make Mom happy this year. 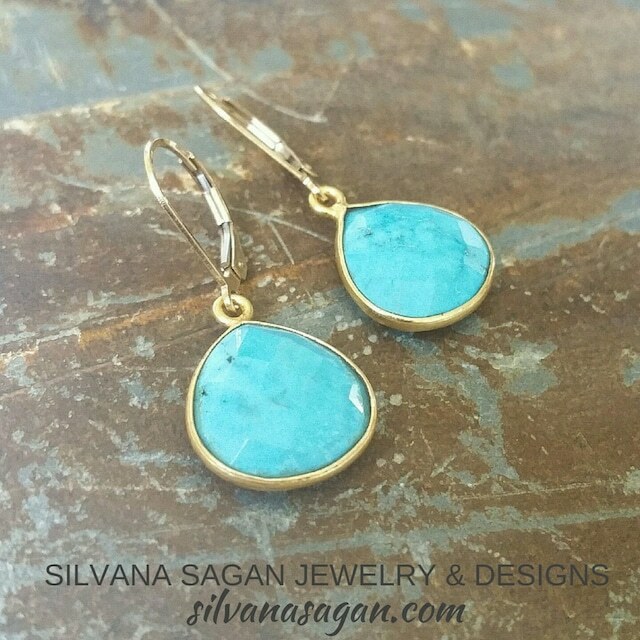 Check out these gift ideas from outstanding artisans. Rachel O is a fellow Art-o-mat artist, and I'm a collector of her earrings. She uses nickel-free posts -- great for those who have sensitive ears. Check out these special finds, for an excellent price, by clicking on the images below. 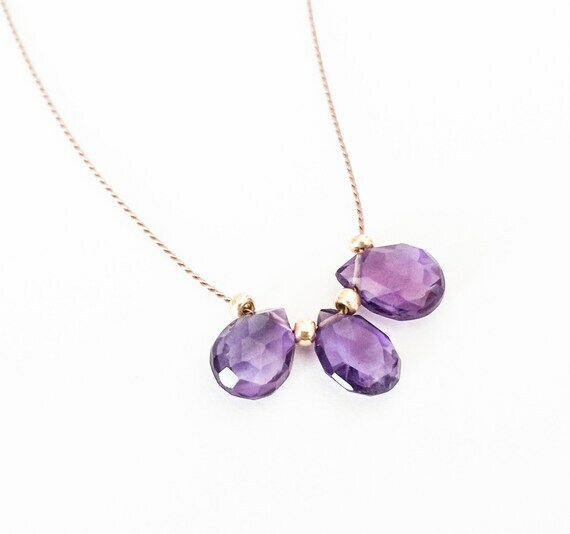 From moonstone to amethyst, necklace to bracelets, Silvana's shop has beautiful finds for Mom. If you are looking for a minimalist + bohemian vibe, then you will have tons of options. 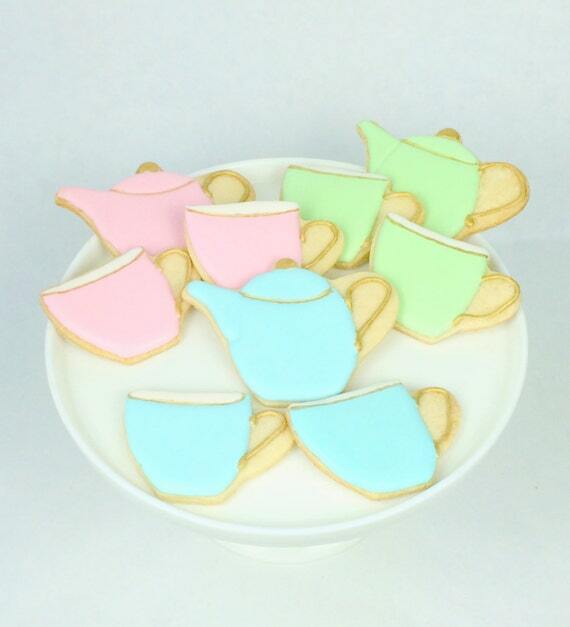 If your mother loves sweets as much as I do, then you can't go wrong with a gift box from P.S. Sweets. Chef Gretchen whips up beautiful and delicious pastry art at great prices. I love her latest "You're tea-riffic" set. A special thanks to my Mom, who always kept me supplied with paper, crayons, tape and glue, no matter how quickly I went through them.